The traditional porcini mushroom risotto is a true delicacy of traditional Italian cuisine that combines two high quality and delicious ingredients: Carnaroli rice and the most exclusive mushroom. Agricola Belvedere measures out high quality dehydrated ingredients, combined with the best rice to obtain a delicious and healthy dish that is quick and easy to prepare. The Agricola Belvedere risottos are a natural product made without preservatives and without monosodium glutamate (MSG). The controlled atmosphere packaging guarantees a fresh product. 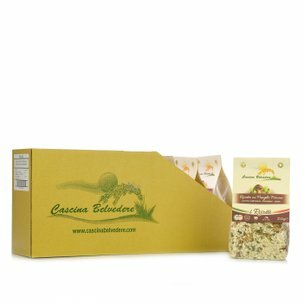 If you are passionate about the porcini mushroom risotto from Cascina Belvedere don't miss the value pack available from Dispensa di Eataly! Ingredients carnaroli rice 91%, porcini mushrooms 3.2% (Boletus edulis), natural sea salt, rice flour, onion, celery, carrot, parsley, extra virgin olive oil, garlic, maize starch, miso (soya, rice, water, salt, koji), yeast extract, spices. For more information on product labels, please contact our Customer Service department. The information on the labels of the products may vary for reasons beyond our control, therefore, there may be discrepancies between the information on the site and that on the products delivered. Please always check the information on the product before consumption or use. For more than a century, the Picco family has been producing rice and risottos with passion, valorising the individual varieties and selecting the best ingredients for their risottos. The result of this production, which is followed along every step of the production chain, is an exquisite product that can be used to make delicious dishes. Porcini Mushroom Risotto 250g 8 pcs.